While Facebook’s dominance and Pinterest’s growth may be grabbing all the headlines, Google+ continues to creep up the rungs of the social media ladder. 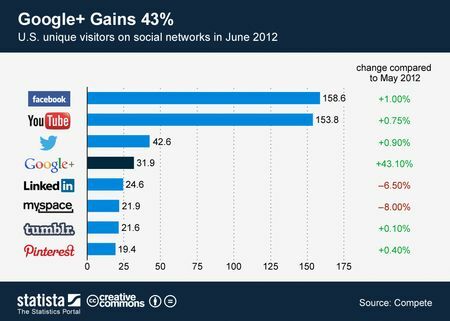 Last week it was reported that Google+ had surpassed LinkedIn in unique users with a 43% jump compared to May. Bottom line: if your company has been ignoring Google+ it’s time to stop and to start thinking about a strategy. 1) Google’s track record: As Kawasaki puts, Google has always delivered a better mousetrap when competitors like Yahoo (search) and Hotmail (email) thought things were good enough. Applying that mentality to social media, where do you think Google will stop? 2) Google is serious: Given all that G+ is integrated with already, in poker terms, Google is all in. During an interview with Wired magazine (September 27, 2011), Bradley Horowitz, Google’s VP of Goole+ Products put it this way. 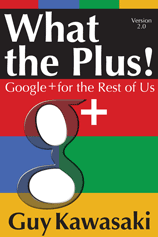 “Google+ is Google itself. We’re extending it across all we do—search, ads, Chrome, Android, Maps, YouTube—so that each of those services contributes to our understanding of who you are.” Already we’ve seen this happening (the most recent being Google Places). For Google there’s no turning back; it’s only forward. 3) Google has infinite talent and resources: This is self-explanatory. It’s not likely a startup is going to challenge Facebook, and Google is no startup. They’ve got the brains and they’ve got the bucks to back it up. 4) Google owns the “River:” And by “river,” Kawasaki is referring to the Internet stream known as search. To call it a stream is an understatement. Face it, Google practically is search and because of it, where the river leads people will follow. 5) Google owns the playing field: When we say “owns” that’s not an exaggeration. As Kawasaki points out, G+ is integrated into search algorithms; Samsung (and soon Motorola) products come pre-loaded with Google+; Gmail users automatically get a G+ account; and it’s a part of the Google browser. That’s way more than a head start. With these points in mind, think for a moment about how Google+ impacts the behavior of your current and potential clients and buyers. The ramification to your company’s SEO strategy and how people will find you alone is huge (and a topic that warrants its own separate discussion). For now, however, what your company should realize is thatIfoogle+ needs to be at the forefront of your social media strategy right up there with Facebook, Twitter, and LinkedIn. If you’d like to learn more about Google+ and how you can integrate this important platform into your social media strategy, contact LyntonWeb. We can provide a solution.